Mr Corey was hidden from members of the press who had gathered outside the Maghaberry jail on Wednesday night. He was taken out in a blacked-out prison van directly to a train station where he was released to his lawyer. Two of those conditions are that Mr Corey is forbidden to give media interviews and also that he must not live in or near his home in Lurgan, County Armagh. 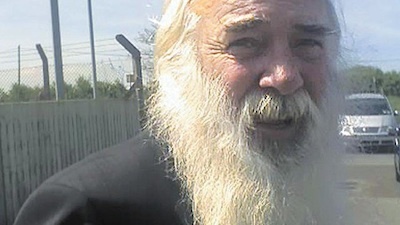 The 63-year-old has been in prison since he was ordered to be interned by the then British Direct Ruler Shaun Woodward, in April 2010, on the basis of “closed material”. His lawyers had been preparing a challenge to his detention in the European court on the basis that he was unable to defend himself against ‘secret’ allegations. The Parole Commission considered his case late last year and had been due to reveal its decision before Christmas. He has never been told why he was detained or what, if any, evidence there was against him. It was reported the Lurgan man was only told on Wednesday that he would be freed within hours. Although still officially denied, his imprisonment is widely seen as a an example of the modern use of internment without trial by the British Crown forces. Cait Trainor from the Release Martin Corey Campaign welcomed his release but said the manner in which it took place spoke volumes. “It is clear the continued imprisonment of Martin Corey was a political embarrassment to the Northern Ireland Office and he was released in a way that would ensure minimum publicity,” she said. Other conditions believed to have been imposed on Mr Corey include restrictions on his attendance at certain public and social events. The Parole Commissioners are protected by legislation which ensures the public are prevented from scrutinising the parole process. But Brian Gormally, director for the Committee on the Administration of Justice, said the commissioners should explain the process and make public their reasons for imposing the release conditions. The CAJ is awaiting the outcome of a judicial review, having challenged the commissioners for refusing to allow its members to act as independent observers during parole hearings. “If indeed there has been a blanket ban on speaking to the media about the determination that seems a clear infringement on the right to freedom of expression,” Mr Gormally said. Sinn Fein Assembly member for west Belfast, Jennifer McCann said the case has jeopardised the public’s trust in the justice system. “He was held without any due process, he has never been questioned from being arrested about any specific incident and indeed his lawyers have never been able to challenge any of the secret evidence that was bought before the parole commissioners,” she said. She said Sinn Fein had consistently raised the issue, and she was glad he was now free to return to his family. “There are very clear lessons which present themselves to the British government,” she said.